Mazon-Verona-Kinsman High School "Red Devils"
Mazon (population 904), as stated on the Mazon High School page of this site, is located on Il. Route 47 eight miles south of Morris in middle Grundy County. The "Johnny Run" creek runs through town. Verona (population 257) is located in middle-western Grundy County at the intersection of Division Road and State Street. This places Verona about 8 miles southeast of Seneca and about 10 miles southwest of Morris. It is believed that Verona never supported its own high school. Its grade school building, once part of the M-V-K School District, is pictured above to the right. Kinsman (population 109) is located in southwestern Grundy County on Kinsman Road just south of Burkhart Road. This places Kinsman about 10 miles south-southeast of Seneca and about 14 miles southwest of Morris. 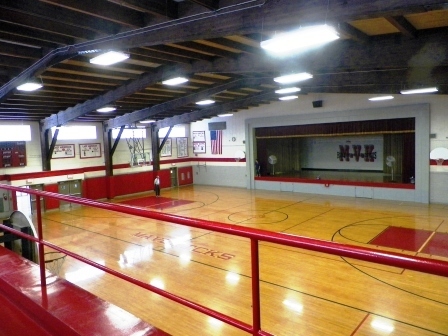 Kinsman also supported its own high school at one time. All three towns are connected by, and were possibly started by, the famous railroad of song, the Atchison, Topeka, & Santa Fe. In 1973, Mazon, Verona, and its neighbor Kinsman joined forces to create a new school district. The new district was named the Mazon-Verona-Kinsman School District. "M-V-K" High School was situated in Mazon. It is not known if there were schools active in Verona and Kinsman as part of the new district. M-V-K High School lasted throughout the 1970s and 1980s, racking up several successful school years. It was in the late 1980s that consolidation talks began to surface. Eventually, the Mazon-Verona-Kinsman High School District was deactivated and annexed into the Seneca High School District in 1990. An elementary school is still active in Mazon. The school is still called the Mazon-Verona-Kinsman School. 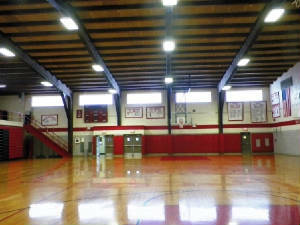 The MVK Middle School hosts grades 5-8 and is housed in the former high school building. Variety and success define the Mazon-Verona-Kinsman High School fortunes in sports. 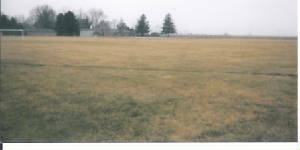 Seven different sports are recorded on the ISHA web site (www.ihsa.org) regarding athletics offered at M-V-K High School. Other sports than those listed below may have been offered. If so please drop us an e-mail at ihsgdwebsite@comcast.net. The Mazon-Verona-Kinsman HS Red Devil boys brought home a regional title and some real nice seasons along the way. Coach Chuck Snow guided the MVK hardwood men to a 100-90 record from 1980 through 1987. 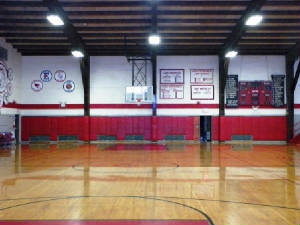 This included a Class 'A' Regional title in the 1986-87 season. The best seasons are listed below. Several scores involving M-V-K HS in the IHSA State Tournament were located on a website titled "Illinois Postseason Basketball Scores." These scores are [posted below as well. *1989-90 Postseason scores, record, and coach's name needed. *School's final season, consolidated to Seneca in the summer of 1990. 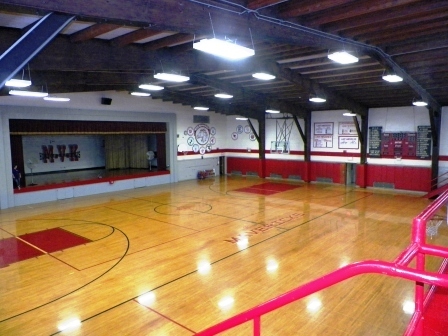 The girls of M-V-K HS also competed in basketball. Their best season as listed on the IHSA web site is listed below. The boys golf team at M-V-K won a Regional Title which is listed below. The Lady Red Devils volleyball team won a District and a Regional. The records and coaches names of these teams are not available. Two boys brought home medals from the state wrestling tournament. Their successes are listed below. The diamond girls for Mazon-Verona-Kinsman enjoyed some excellent success. Though it is not recorded that they won any IHSA hardware, M-V-K HS had some very good seasons under the guidance of Coach Mary Mitchell. The best are listed below. Two Mazon-Verona-Kinsman boys won medals at the State Track Meet. The Illinois Theatre Festival is the largest, non-competetive high school theatre festival in the world. It was organized in 1976 by teachers from the Chicago suburbs. This festival is still going strong as they perform at the University of Illinois (Champaign-Urbana) and Illinois State University every other January. MVKHS participated in this festival from 1976 to 1985 and again in 1988. "I am a graduate of Mazon-Verona-Kinsman High School class of 1976. The former Mazon High School became a Unit district in 1973, following my freshman year. Four of my siblings and I attended the school as did my father, Paul W. Esgar (Class of '41) and my mother Ardella (Male) Harris (Class of '48). My father-in-law, William R. Murray came to M-V-K in 1973 as the principal when the former principal of Mazon High School, William "Scottie" Lynch became the Superintendent for the newly formed M-V-K district." I am an alum of Mazon-Verona-Kinsman High School. I graduated with the class of 1975. My name is Kelli (Houchin) Unger. I have 1 sister and 3 brothers that also graduated from M-V-K. My dad is Keith Houchin. He taught Freshman English, was Athletic Director, and coached basketball, baseball, and golf at M-V-K. He had the magical Red Devil's basketball team of 1967-1968. In 1990, when M-V-K annexed with Seneca, they took all of the tenured teachers over with them. My brother, Kirk Houchin had just been tenured that year and was fortunate to be among the ones moving to Seneca. He was the Spanish teacher, but now is the Guidance Counselor/Varsity baseball coach at Seneca. My dad taught 3 years at Seneca (which is also HIS alma mater), then retired. I remember the very last graduation at M-V-K HS as told to me by my dad. He was asked by the school to help 'lead' the graduates when it came time to change the tassels on their caps to the other side. My dad got up in front of the crowd, sang the M-V-K school song by himself, then instructed the graduating class to move their tassels over to the other side. He, then, finished by singing the Seneca school song by himself. It was a nice touch/smooth transition when one thinks of ending one school and moving on to the other."